I have installed Windows 10 on my Macbook Pro mid-2012 (MacBookPro9,1) using the EFI method. Note: I am intentionally wanting to use Windows 10 in EFI mode instead of the legacy MBR/BIOS method. I was able to successfully install Windows 10 using EFI method. After installing Windows 10, I installed the latest v6 of Bootcamp drivers and support software. Everything works except for the below listed below. I am unable to get audio to work. There is no sound from the speakers or headphones. Device manager shows "This device cannot start. (Code 10)" for High Definition Audio Controller. After reading around in other forums, the audio issue could be related to Intel graphics drivers. I am unable properly install the integrated Intel HD 4000 graphics drivers also. As shown in the attached image, the Device Manager shows a yellow exclamation mark on "Microsoft Basic Display Adapter" and "High Definition Audio Controller". The attached image shows the device error for each of these. I tried updating the drivers for the Microsoft Basic Display Adapter to Intel HD 4000 drivers using multiple methods (listed below). 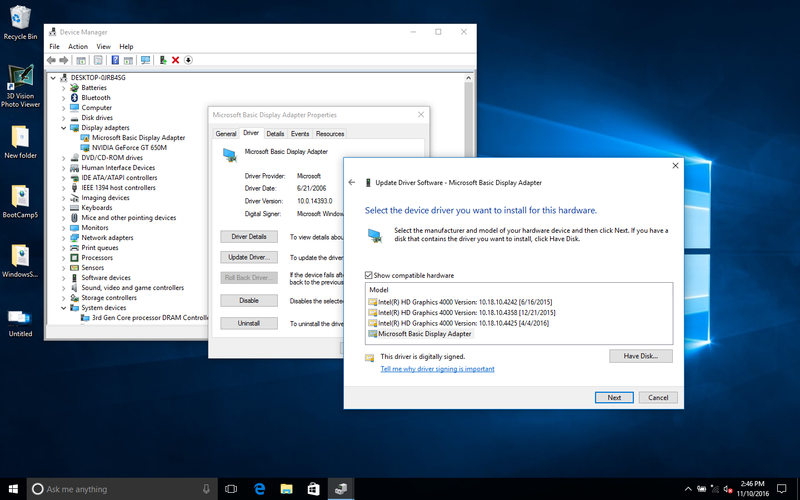 In all cases, the drivers are detected but while the drivers are being installed, Windows crashes and automatically reboots. If I am connected to the internet, Windows 10 by default automatically tries to install the latest display drivers in the background. This leads the computer crashing and rebooting. 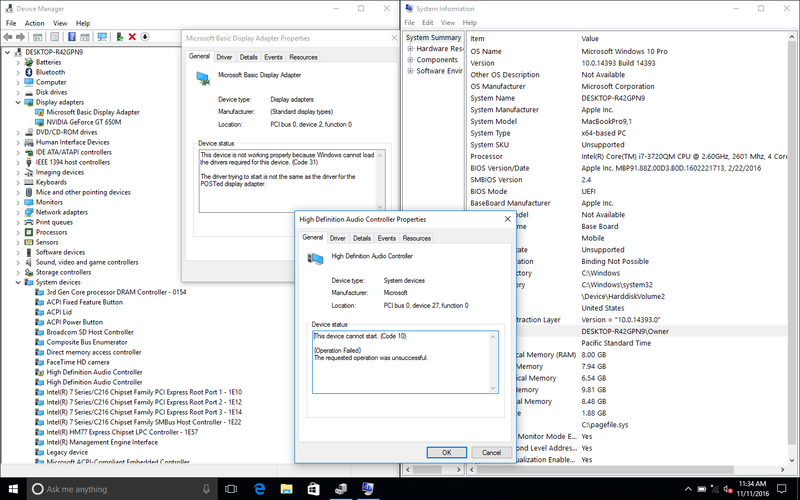 I have to manually prevent Windows 10 from automatically updating the drivers to stop the crashing from occurring. Is there way to at-least get the audio to work? Is there anyway I can properly get the Intel HD 4000 drivers to install in the EFI install of Windows 10 on Macbook Pro mid 2012? So far, I have been unable to get the headphones or the internal speakers working via EFI boot. I haven't tried a default Boot Camp install since I want to run off an external, but it sounds like it works just fine if you're willing to go that route. The good news is if you can get the Boot Camp 6.0 support drivers, it installs an NVIDIA driver compatible with our machine, and (just like the Intel driver) it ALSO handles the audio. It won't get your headphones or speakers working, but it DOES see them and it DOES transmit audio over the display port to HDMI. One more trick I haven't tried -- burning the ISO to DVD and installing from that. Supposedly that forces the installation into Legacy mode, in which case the Intel/audio drivers install correctly. I think they attempted this in order to install an eGPU but it serves the purpose of allowing the on-board audio to work. The only thing that isn't working on my 2012 non-retina MBP is the on board graphics driver (Intel Graphics HD 4000) which is fine because the NVIDIA drivers work fine (only with the most recent driver patch from December 28, 2018, the "current" drivers from December 12 crash the computer) and allow proper "sleep" which wasn't possible previously. Only feature that doesn't work is the ability to adjust the brightness. Staring at this very bright screen will drive me crazy, but in trying to fix this one last problem, I have had to re-install Windows twice, so I am about ready to give up. Any ideas? Not the answer you're looking for? Browse other questions tagged bootcamp windows graphics efi intel .